No Bus! Athletes should be prepared to provide own transportation to meet. 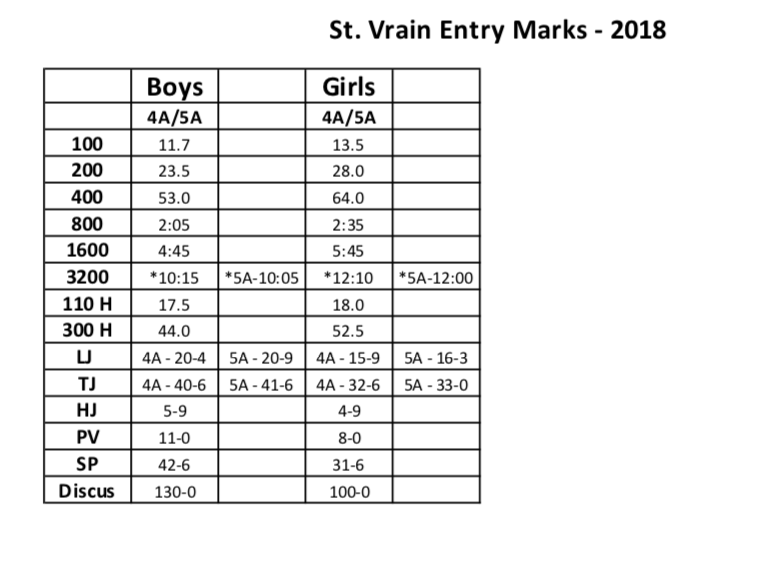 ​enter an individual event in the St Vrain meet. ​No qualifying marks for relays. Release from Class @ 1:00 Bus Departs @ 1:15 Yes-RETURN BUS! ​to give yourself plenty of time to warm up. Bring LOTS of warm clothes! You may depart when you are finished with your cool down. 7:40am (Pole Vault Check, Shot and Disc Implement Weigh In). ​Entries posted at Practice too! PICTURES ARE MONDAY the 16th @ 2:45! All athletes who did not attend the Thunderhawk will attend Thornton. ​ARRANGE OWN TRANSPORTATION AT THE CONCLUSION OF THE MEET!